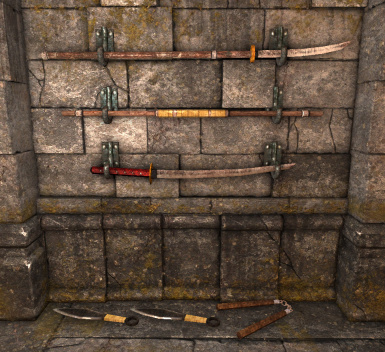 A growing pack of oriental style weaponry for use in Legend of Grimrock mods. Thanks to Xanathar, Diarmuid, Isaac, Neikun, Msyblade and everyone else who provides feedback and suggestions on Skype and the Grimrock forums. Added katana and nunchaku weapons. Balanced quarterstaff to be a little less powerful. Made quarterstaff a reach weapon. Changed install process: You must now also create a script entity called ow_script and paste the provided script into your dungeon! Added a Wakizashi. If you wield both the Wakizashi and the Katana you get an evasion bonus. Added 4 egg shell bombs (Fire, Ice, Poison, Shock) which are basically weaker versions of the standard bombs. Quarterstaff now uses the staves skill and gives an evasion bonus of 3 + (Staves Skill / 4). Makes this a defensive item for mages. Fixed bug where wall hooks would not accept a quarterstaff. Fixed bug: Nunchaku are now actually equippable! 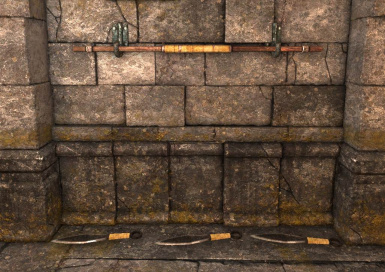 Tweak: Wall hook alcoves orient weapons better. Added low and high wall hook alcoves so that you can mount 3 weapons on a wall. 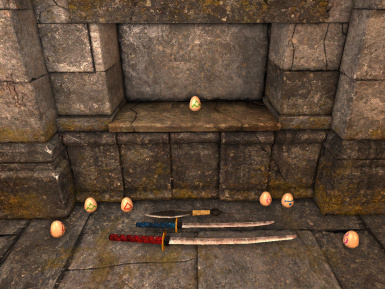 This package is intended to provide a collection of oriental-inspired low-poly weapons for use in Legend of Grimrock mods. This mod is being developed as my way of learning MODO and 3D modelling in general, so expect them to be of varying quality and, hopefully, get better over time. Let me know if you would like a specific model making/tweaking/improving. NOTE: Since version 0.4.0 the install instructions have changed. You must now also add a script entity and copy and paste the provided script from the package into your dungeon! Weapons: Kunai, Katana, Wakizashi, Naginata, Nunchaku, Quarterstaff, Egg Shell Bombs (Poison, Fire, Shock, Ice). Objects: Wall Hooks for holder Staves (including high and low versions).